The National Oceanic and Atmospheric Administration officially launched its Arctic survey season in Alaska yesterday. Two research ships, Ranierand Fairweather, will set out from Kodiak to chart the underwater and shoreline topography of the Arctic Ocean. NOAA communications specialist Dawn Forsythe says the mission is part of an ongoing effort to improve navigation in an area already experiencing increases in marine traffic. The updates are, in some cases, long overdue — recorded by Arctic explorers over one hundred years ago. “It’s said some of it dates back to Captain Cook’s time,” said Forsythe. Accurately mapping the Arctic is no easy task. She said it could take a century or more to chart every inch of Arctic water in U.S. territory. So the ships will focus on “priority areas” for the 2015 season, including Point Clarence, Kotzebue Sound and Point Hope. 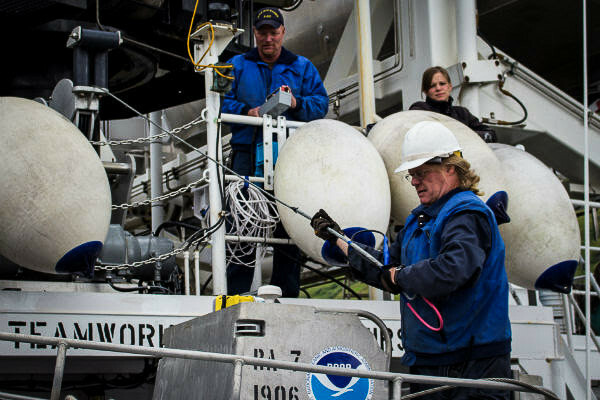 The research crews will use echo beams and under-water sonar to measure ocean depth and record navigational dangers. Those recordings will then be used to update existing charts, or create new ones altogether. Forsythe said data gathered this summer could be incorporated into public charts and electronic navigational software as early as 2016.